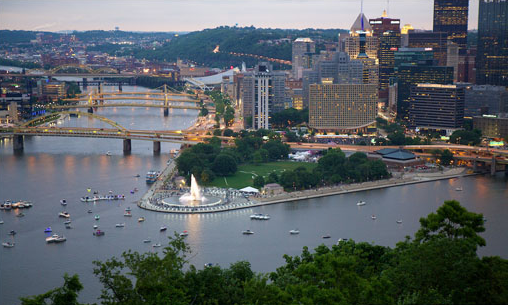 From its streets to its rivers to its skyline, Pittsburgh is a city in transformation. The Steel City is diversifying its economy, improving its streetscape and becoming a new hub for the creative class. Business Insider has even declared Pittsburgh to be “The Next Hipster Haven." But the transformation has meant more than coffee shops, bike-share, and startups—even though that’s certainly playing a part. As the city changes, though, it’s too easy to ask if Pittsburgh is the “Next [Enter City Here].” Because the “Next Pittsburgh” will not be the “Next Austin,” or even the “Next Portland.” It's shaping up to be something entirely it’s own. Simply put, "The Next Pittsburgh" will be just that. 1. The Tower at PNC Plaza Pittsburgh’s skyline will change dramatically next year as the new 32-story Tower at PNC Plaza marks its place. The financial services company is calling their new Gensler-designed headquarters “the world’s greenest skyrise.” While that’s a bold claim, the glass tower will have a lot more than the typical green fixings. It is expected to surpass LEED Platinum status with its massive solar collector on the roof and a double-skin facade that opens and closes according to the temperature. Also, there will be green roofs, because, obviously. 2. Market Square Installation Following a major renovation in 2010, the city’s Market Square recently unveiled a temporary, public art installation called Congregation. The work is described as “an interactive kinetic video and sound installation designed and choreographed for pedestrian performers.” Essentially, the installation turned the public space into a dynamic public stage. And best of all, it was completely free and open to all ages. While Congregation recently closed, it is part of a new three-year initiative to bring art to the city during those cold, winter months. 3. Produce Terminal Significant changes could be in store for Pittsburgh’s old produce terminal in the city’s vibrant Strip District. What those changes will look like, though, isn’t clear just yet. A local developer had planned to renovate two-thirds of the 1,500-foot-long structure and demolish the rest to make way for residential and office space, but the city has put that plan on hold. Mayor Bill Peduto is intent on preserving and reusing the entire building with possible uses including shopping, retail, and arts space. 4. The Allegheny Riverfront Green Boulevard The Produce Terminal is adjacent to the much larger Riverfront Landing residential and office project, which is part of the much, much larger Allegheny Riverfront Green Boulevard plan. The latter aims to transform six miles of industrial land into new riverfront parks and mixed-use development. The ambitious proposal was conceived five years ago by the city, the Urban Redevelopment Authority and Riverlife—a public-private partnership that advocates for riverfront parks. While it is still in the planning process, it was envisioned by Sasaki Associates for a study last year. Their proposed master plan includes new development, green space, bike paths, and converting an old railway into a commuter train. 5. Point State Park After a multi-year, multi-million dollar overhaul, Point State Park is once again entirely worthy of its iconic location. Situated right where the Monongahela River meets the Allegheny to form the Ohio River, the refurbished 36-acre park boasts new lawns, landscaping, seating, a café, and improved access to the water. Capping off the renovation, which was led by Marion Pressley Associates, is the park’s revamped fountain—which has been described as its “crown jewel.” The fountain now has a “disappearing edge waterfall feature, new lighting including colors for special events, all new surfaces, pumping equipment, and controls.” Of course, Point State Park is an impressive public space in its own right, but it’s only a portion of the city’s 13-miles of riverfront parks and trails. 6. Eastside III The city recently broke ground on Eastside III, a transit-oriented, mixed-use development in the city’s East Liberty neighborhood. The phased project will consist of three buildings, the first of which is expected to open next spring. The mixed-use project—designed by Design Collective—is being built alongside a revamped multi-modal transit hub by CDM Smith. The hub will be able to accommodate 1,000 daily bus arrivals and departures, and is expected to increase connections between neighborhoods. The new transit plaza includes "a repurposed bus ramp and a new cap over the railroad and busway." 7. Bike Share Later this year, Pittsburgh will join the ranks of cities like New York, Chicago, and Washington, D.C. when it launches its own bike-share program. While details on the program are limited, the program is slated to roll-out this summer with about 500 bikes at 50 stations. The goal is to ultimately expand the program to 1,000 to 1,500 bikes at 100 to 150 stations. The big question, of course, is what will the system be called. The name is still under wraps, but it will have a corporate sponsor. So, place your bets now people. 8. TalkPGH While Jimmy Fallon and Seth Meyers are the biggest names in late-night these days, the most unique talk-show in the country was recently driving through the streets of Pittsburgh. Last Spring, Talk PGH—a talk-show that took place inside of a truck, yes inside of a truck—appeared in all of Pittsburgh’s 90 neighborhoods. As part of PLANPGH, the city’s 25-year agenda for growth, the show was a way for the city to interview residents and hear their hopes for Pittsburgh's urban design. 9. Carnegie Mellon's Sherman and Joyce Bowie Scott Hall Carnegie Mellon’s already impressive campus will become even more so when the Sherman and Joyce Bowie Scott Hall—or "Scott Hall" as it's known locally—opens next year. The 100,000-square-foot building, designed by Office 52 and Stantec, will contain laboratories, libraries, office space, and a café. It will also house a cleanroom facility, “which will become the new home for Nano Fabrication, the Scott Institute for Energy Innovation.” 10. The Car-Free Road Pittsburgh just one-upped every city priding themselves on their modest, new bike infrastructure. When faced with a dangerous road that put cyclists at risk, the city didn’t just add new protected bike lanes, they shut down part of a roadway from cars entirely. Now, the section of Pocusset Street, which winds through a city park is reserved exclusively for pedestrians and cyclists. According to Bike Pittsburgh, the Department of Public Works “repainted it with bi-directional bike-lanes, designated pedestrian walkways, included LED street lighting, and installed reflective bollards to block traffic from entering at either end.” 11. Ace Hotel And rounding out the list is, of course, a new Ace Hotel. While the Steel City will likely not become “The Next Portland”—an idea raised by both Pacific Standard and The Washington Post—the city will certainly move in Stumptown's direction when the exhaustingly trendy hotel opens in Pittsburgh next year. The 36-room Ace will be housed in a former YMCA building in the city’s East Liberty neighborhood. There are currently no renderings of the project, but one can expect plenty of Edison bulbs, murals, and some inexplicable, giant, vintage letters. As part of the city’s first ever 25-year development plan, PLANPGH, Pittsburgh is taking a cue from Boston and rolling out a mobile talk show truck to hear what residents of each of the city’s 90 neighborhoods have to say about public art and urban design. 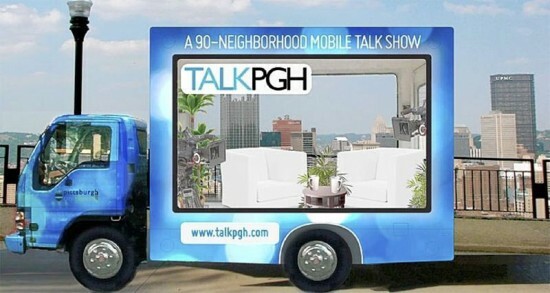 TALKPGH will be cruising throughout the city on the glass-walled back of a box truck through April 20th as a public outreach effort from ARTPGH and DESIGNPGH, the public art and urban design branches of PLANPGH. The concerns and opinions voiced on the talk show will be taken into consideration during the creation of Pittsburgh’s first design manual, which will guide the city’s growth over the next 25 years. Public art and urban design will be key components of the plan, and as Morton Brown, the city’s manager of public art told the Pittsburgh Post-Gazette, officials are dedicated to making sure there will be room in the budget for high-quality art and design "in all city projects, from bridges to senior centers to pools… We want to raise the bar on public and private property. We’ve gathered every community design plan that has ever been done in neighborhoods, to pick the ‘greatest hits’ of each and to educate people on best practice models." With opportunities for growth throughout the city, TALKPGH gives residents an opportunity to raise awareness of their own neighborhoods, and bring their own local concerns to the forefront of planning discussions. If you live in Pittsburgh and want to have your voice heard or know someone who does, check here to see when TALKPGH is coming to your neighborhood and send an email to info@talkpgh.com or call 1-408-800-3176 to become an interviewee or a neighborhood liaison.